Louise Yates Robison was the seventh General President of the Relief Society, meaning that she oversaw the entire world-wide organization of women for The Church of Jesus Christ of Latter-day Saints, whose members are sometimes called Mormons. She was born Sarah Louisa Yates, although she later went by Louise, on May 27, 1866, in Scipio, Utah. Her parents had been asked by the Church of Jesus Christ to move there to help colonize the region. She lived the life of a pioneer, learning to work with wool, knit, farm, sew, and make braided straw hats. She attended Brigham Young Academy for one year, followed by a dressmaking course. In 1883, she married Joseph Lyman Robison. Together they had six children. She studied her children’s school lessons with them in order to continue learning. When her children were grown, she had a desire to complete her education. She began taking university extension classes and arose at 4 AM each day in order to study for two hours. 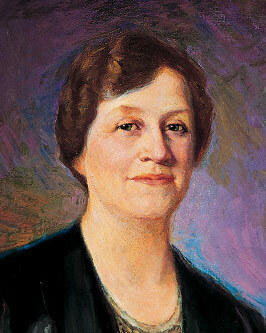 She was called to serve as the General Relief Society president from 1928–1939. She had previously served as the second counselor to the president of the General Relief Society. At the time of her calling to that position, she was certain a mistake had been made. She explained to Heber J. Grant, who issued the call, that she had a limited education, no social position, and no wealth. She was very shy and hated the limelight. She told him she was just a humble woman, not what the women of the Church would expect from a leader. President Grant informed her that 85 percent of the women in the Church were humble women and she was being called to lead them. She started the Mormon Handicraft Shop in Salt Lake City, Utah, in 1937 to help Mormon women be able to earn income while remaining in the home with their children. She considered it important for women to stay home, although she also recognized the need for them to provide income. This program was eventually turned over to Deseret Book Company. The Relief Society attempted to assist local government agencies in caring for the poor. Unfortunately, during the Depression, the needs were so great that a caseworker for the Relief Society went from 78 families in 1929 to more than 700 in 1934. The caseload became too great for them to handle. Sister Robinson said that the government was doing a wonderful thing in helping the poor, but that the Church needed to continue to teach self-reliance so families would not seek government help, if they were able to care for themselves, and that the Church needed to continue to do as much as it could manage. This became easier when the Church organized a welfare program that could do more than the women alone had been able to accomplish. Louise was the first General Relief Society president to speak in General Conference. This occurred in October 1929. She visited Europe, the first Relief Society president to do so, and while there, was a delegate to the Tenth World Congress of the International Council of Women, held in Paris. She initiated a number of other official projects, including the first Relief Society monument, the Singing Mothers choirs, and the official gold and blue colors. However, she insisted the Relief Society’s most important contribution during that time was the untold hours of service to others through its ordinary members. After her term ended, she moved to San Francisco to live with her daughter Gladys Winter. She died March 30, 1946. This page was last edited on 18 March 2013, at 21:56.